At the time of its inception, the euro area was often derided by (mostly Anglo-Saxon) economists as an incomplete and sub-optimal currency area. According to its detractors, the union lacked enough private and public risk-sharing channels, and factor mobility, to justify relinquishing monetary sovereignty (e.g. Eichengreen 1992). After a decade of apparent success, both in the convergence of living standards and in the stabilisation of monetary aggregates, these gloomy views appeared vindicated by the 2010-12 crisis and the ensuing slow recovery. It is widely considered that, while the euro improved the credibility of monetary policy in many member states that had previously been relying on frequent depreciations to maintain competitiveness, it may have done so at the expense of sorely needed monetary autonomy in crucial times. Is there a way to improve stabilisation mechanisms in the euro area, while preserving the trade-enhancing and institutional benefits of integration afforded by the common currency? I suggest it would be possible for the ECB to fine-tune some of its monetary policy tools in a way more tailored to the situation of each country, without permanent transfers and while remaining fully independent of national governments. The framework, which I label ‘targeted inflation targeting’, would require the ECB to adapt monetary and credit conditions across member states, while preserving the fluidity of cross-border payments and the unity of the common market. It aims at improving the tailoring of monetary policy to asymmetric shocks, while preserving the credibility benefits of rules-based interventions, and maintaining long-term neutrality and commitment to no fiscal transfers. 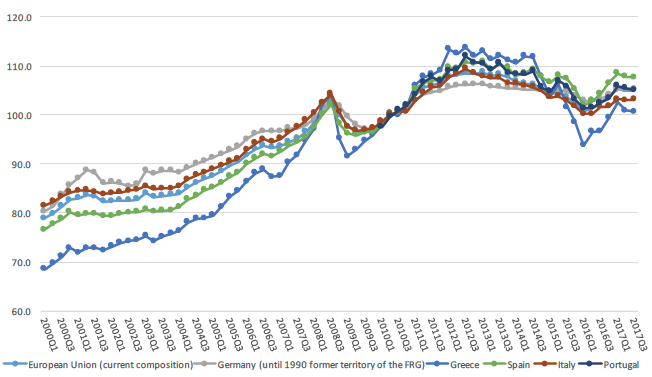 Recent debates about convergence and stabilisation of macroeconomic cycles in the euro area, embodied by the joint French-German Meseberg Declaration, have focused on the design of budget instruments to support counter-cyclical fiscal policies, such as a cross-national unemployment reinsurance scheme. Most of the public and academic discussion has centred around instruments designed to tackle crisis times, such as emergency credit lines to countries affected by large asymmetric shocks, the creation of a European deposit insurance scheme to complete the Banking Union, and a reform of the European stability mechanism (see for example the VoxEU debate opened by Bénassy-Quéré et al. 2018). While regular outbursts of acute financial distress may occur, the true underlying weakness of the euro area lies in the medium-term divergence of productivity dynamics, wage inflation, and price competitiveness, between ‘core’ countries and ‘periphery’ economies. Large and persistent differences in the path of domestic producer price levels across euro area member states have fostered competitiveness differentials, current account imbalances, and external public and private debt accumulation, as public and private savings declined in ‘Southern’ economies without commensurate investments in export-generating tradable sectors. These misalignments, in turn, required internal devaluation and painful fiscal consolidation, given the impossibility of exchange rate adjustment when ‘sudden stops’ occurred and made the refinancing of external liabilities more difficult (e.g. Schmitt-Grohé and Uribe 2016). Monetary policy can help in stabilising short-term demand driven fluctuations along the business cycle. A key dilemma for the ECB, however, stems from the fact that its mandate leads it to stabilise the aggregate price level in the euro area, without considering regional divergences. In the words of Farhi and Werning (2017), in a currency union, the central monetary authority optimally sets the aggregate labour wedge to zero, but is constrained to let national labour wedges diverge away from that efficient level. 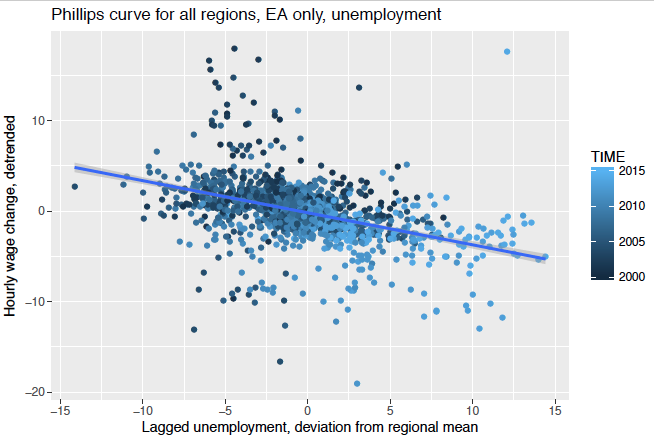 Indeed, in a recent paper (Levy 2018), I offer evidence that national and even regional divergences in unemployment levels are associated with diverging wage dynamics, suggesting a ‘Phillips curve’ operates at the local level as well as in the aggregate euro area (see Figure 1). Some have argued that these divergent dynamics evidence the need to take back control of the exchange rate lever and exit the euro. Others suggested that, in the presence of price and wage stickiness, fiscal policies designed to mimic the price adjustments generated by a depreciation, such as VAT combined with payroll tax reductions, are required (Farhi et al. 2013). These reform proposals take as given the monetary authority’s objective of stabilising aggregate inflation dynamics in the euro area, and argue that it is then necessary to either exit the ‘golden straightjacket’ of the euro, or to complement it by aggressive counter-cyclical fiscal policies or risk-sharing. As a complement to the latter, I suggest that ‘targeted inflation targeting’ may help in counteracting country-specific aggregate demand shocks. The ECB should increase (relative) expansionary interventions in countries where domestic macroeconomic conditions signal low aggregate demand. In the case of long-term refinancing operations and ‘quantitative easing’ policies of direct asset market interventions, the ECB should be allowed to re-weight its asset purchases across domestic financial markets, depending on a targeted counter-cyclical measure of aggregate demand conditions. This could take the form of the following rule – the ECB increases asset purchases allocations to countries where either inflation or nominal spending growth trails behind its medium-term average, for example when the (seasonally adjusted) last quarter value stands below the smoothed value of the last eight quarters. This smoothing rule ensures that only temporary targeted easing of monetary conditions can occur, and not permanent implicit transfers for countries with lower trend growth of the price level. Rather than country-specific consumer price inflation, the targeted targeting rule should be based on producer price inflation divergence (see Figure 2). Indeed, national PPI inflation, as shown in Gali and Monacelli (2008), is a key measure of domestic price misalignments (rather than consumer price inflation, which is affected by import price dynamics within the union). Such ‘targeted targeting’ may overcome the limitations faced by the ECB in the recent use of unconventional monetary policy interventions. Indeed, the ECB has allocated QE asset purchases of public and private liabilities across member states according to their ‘capital key’ in the ECB’s equity repartition, to ensure an independent and rules-based allocation mechanism. This mechanically led to large purchases of German assets, despite the lesser need for relaxing credit and monetary conditions there. I suggest that the ECB could have maintained a rules-based approach, while targeting more aggressively countries in a weaker macroeconomic position, using a counter-cyclical rule of the form proposed above. Targeted inflation targeting may be required most urgently to adapt unconventional interventions in crisis times. It could, however, also apply alongside regular business cycles, for example by fine-tuning liquidity provision across countries using a similar counter-cyclical rule, based on recent price level dynamics. For example, the ‘haircut’ applied to sovereign debt from various member states, which determines their liquidity value during open market operations, may be modulated based on the recent inflation dynamics. The first one comes from the risk that, if price adjustments (such as higher German inflation) are indeed required to realign real exchange rates, ‘targeted targeting’ would delay this process. However, this critique is not fully valid if the main source of misalignment is coming from asymmetric aggregate demand shocks; if this is the case, there is a role for targeted monetary interventions, much in the same way as for counter-cyclical fiscal policy. Some may also argue that producer price inflation is not the best measure of the output gap, and nominal GDP or sovereign spreads would provide a more accurate picture of domestic macroeconomic conditions. While this may very well be the case, targeted inflation targeting is closer to the current ECB mandate of targeting CPI at the aggregate level, and thus both easier to implement using traditional policy tools, and less likely to require controversial treaty changes. Finally, it could be said that reforming the ECB capital key or haircut policy may not have first-order effects on the monetary stance. While this is a fair objection, at any rate, the well-known impossibility ‘trilemma’ (that countries cannot simultaneously have autonomous monetary policies, free capital flows, and fixed exchange rates) mechanically limits the scope for monetary policy adaptation to national circumstances in the euro area. This does not mean, however, that nothing is better than something. Within the institutional constraints of its mandated scope, the ECB should maximise the appropriateness of the monetary stance to country-specific conditions. This would provide support to counter-cyclical fiscal policies both at the national and union-wide levels, answer current critiques of the monetary union, and thus provide some breathing space for the implementation of longer-term structural convergence policies. Bénassy-Quéré, A, M Brunnermeier, H Enderlein, E Farhi, M Fratzscher, C Fuest, P-O Gourinchas, P Martin, J Pisani- Ferry, H Rey, I Schnabel, N Véron, B Weder di Mauro, and J Zettelmeyer (2018), “Reconciling risk sharing with market discipline: A constructive approach to euro area reform”, CEPR Policy Insight 91. Eichengreen, B (1992), “Is Europe an optimum currency area?” in The European Community after 1992, Palgrave Macmillan: 138-161. Farhi, E, G Gopinath and O Itskhoki (2013), “Fiscal devaluations”, Review of Economic Studies 81(2): 725–760. Farhi, E and I Werning (2017), “Fiscal unions”, American Economic Review 107(12): 3788–3834. Gali, J and T Monacelli (2008), “Optimal monetary and fiscal policy in a currency union”, Journal of international economics 76(1): 116–132. Levy, A (2018), “Estimating the euro area Phillips curve with regional data”, mimeo. Schmitt-Grohé, S and M Uribe (2016), “Downward nominal wage rigidity, currency pegs, and involuntary unemployment”, Journal of Political Economy 124(5): 1466–1514.